I have been blogging for a long time on various sites. If you have also, then you know times are changing. It use to be that anyone could start up a blog, create a Facebook Fan page and be successful in a short amount of time. But, thanks to the oh so crafty creators of Facebook, that is no longer possible. Spending lots of time AND money to gain your following, only for them to swop in and take them all away. Now, with the popularity of sites like Pinterest, the little blogger has a chance again to shine. But it takes time, and skills and lots of dedication. I started this small little site about 2 months ago. I was burnt out on deal blogging, and wanted a more creative outlet for things I enjoyed. I knew it would not be easy, even now my poor little Facebook page only has just over 200 fans, and I am okay with that. My Pinterest account though, that is over 2K followers right now, and is growing more and more everyday. Why? Hard work. Before we get down to the nitty gritty, lets take a look at my traffic on this site. You see that giant jump on the last few days of the chart? Those visitors are not coming from Facebook, they are coming from all over the internet. Why? Because I have made my site present in a lot of locations. Below is an overview of where my visitors are coming from on a daily basis. 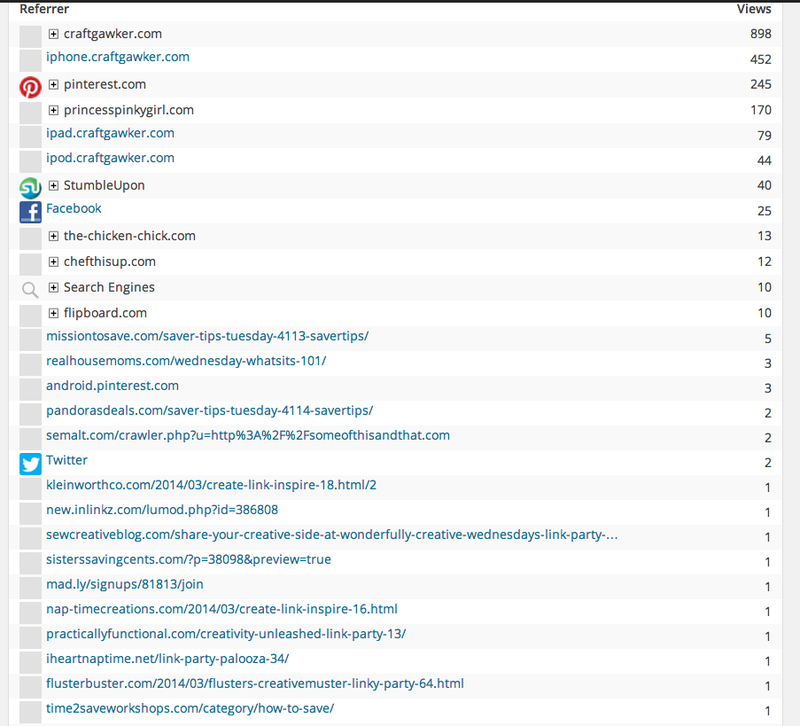 As you can see, Craftgawker is my number 1 referrer. This is because I strive to take excellent photos for my site. Most people blog hopping are visual and like to see “pretty” things. It does not take an expensive camera and equipment to take stunning photos, it just takes time and some practice. If your photos are not “pretty” chances are you will be passed up by readers. The second top referrer is of course, Pinterest. Again, it is all about the visual aids here. It is kind of like high school where the pretty girl gets all of the boys. Well, the pretty pictures get all of the clicks. Commenting, liking, pinning other peoples pins and following others will increase your exposure as well and gain you more followers. Next, StumbleUpon. If you are not utilizing this source, then you are missing out on traffic. Even a little traffic can make a BIG difference. It just takes one person to share something for it to go viral. StumbleUpon can do just that. If you check out this post you can see that it has been stumbled thousands of times. 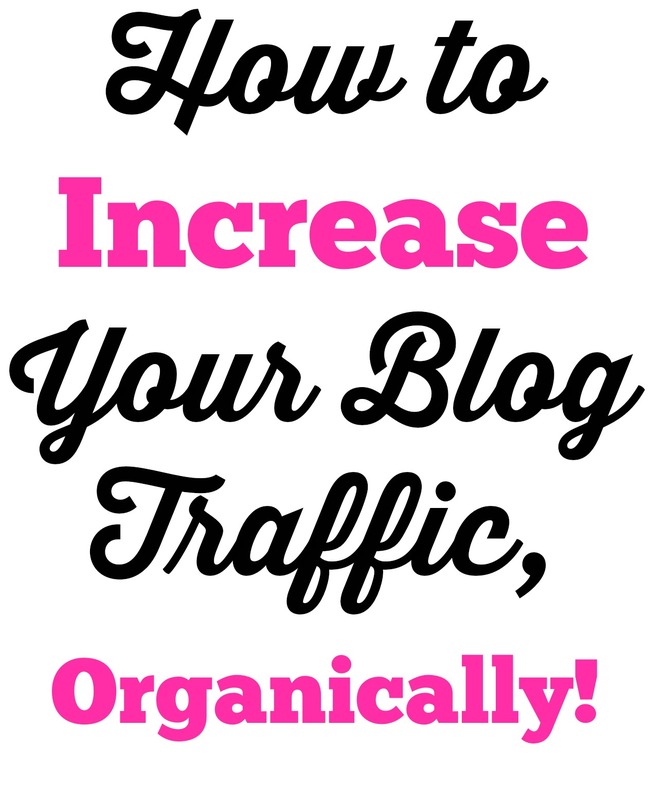 Another big traffic source is OTHER bloggers! Yes, other bloggers! Network, network, network! I am a blogger stalker. Daily I am adding my new content to blog linkies and commenting on other blogs. Why? It not only gets me noticed by larger bloggers, but also by their readers! The more you add to linkies and comment, the better the chance you will get noticed. I have been featured on several other blogs because of linkies. This not only gains exposure, but helps with Google page rank because of the back links! I have a great list available of the linkies that I join on a daily basis that you can see here. Google is another large traffic source, having a little bit of knowledge on SEO can go a long way in getting ranked in Google. Link backs from other bloggers and knowing how to maximize your key words is the important thing. This little site started to gain Google referrals in the first week just because of some simple key wording. And as you can see, the rest of my traffic is trickling in from Facebook and other bloggers, which adds up in the long run. What are your tips for increasing your blog traffic? Let us know in the comments! This is great! Thanks for sharing. I completely agree. I think that networking is huge. I never realized that before and my new blog is also 2 months old. Now that I’m networking I’m finding that great and supportive “blog community” I always heard bloggers refer to. I love it! Tee-hee—found you from pinterest too. Thanks for following me–following you back—Have a great weekend…P.S. Do you have any specific stumbleupon tips to share??? I just started it a couple weeks ago—I love it–I think it is super fun. And it has been helping. With Stumbleupon I find it best to stumble 1 of my post to every 10-15 other sites. WOW!!! This is really REALLY Great!